The Apollo Box Macrame Hammock Chair is hand crafted to the highest quality. This beautiful chair provides luxurious comfort as you doze away or catch up with a good book. Hanging chairs are the new, cool thing that can be suspended from the ceiling inside your home, from a sturdy branch in your garden, from a strong beam on your porch. They bring coziness anywhere you place it. Makes a sweet snuggle swing to hang outside and enjoy nature, rest under the sunset, relax poolside, or lounge on the deck - Nestle into cozy "cocoon" while reading - Listen to the sound of rain, crickets, bird chirping, or quiet night of stargazing, etc. Lounge around the patio all season long or enjoy adventure in the most unexpected places. Hang your swing in the bedroom anytime you need to curl up and "get away" or mount it in a playroom, living room, or sunroom. Spend the day reading on the deck, relaxing by the pool, or nestling into a "cocoon" on the patio. As night falls, gaze at the stars from your hammock with a view that puts you in the best seat in the house. When you're ready to re-locate, simply transport this lightweight swing to your next destination. It can be moved anywhere from the front porch in the spring to inside the home during winter. If you decide to hang your hammock chair Swing Style, you can use it as a comfy swing which allows you to sway forth and back. In this case, you will need two anchor points in your ceiling indoors or a single sturdy tree branch in your backyard. Hanging your hammock chair Pivot Style allows you to rotate 360 degrees and drift smoothly while you relax. If you prefer this hanging style, you will need only one anchor point. This hanging technique being suspended from the one anchor point with a chain or rope. 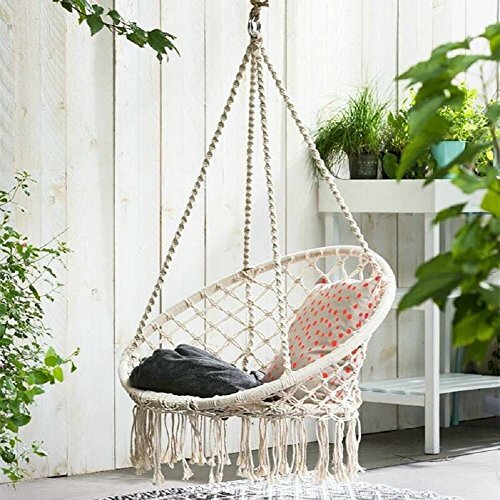 GREAT FOR INDOOR&OUTDOOR： Macrame swing net chair can be used as a light cradle and swing reading chair or relaxing meditation chair. Great addition to home, bedroom, sunroom, kid's room, living room, and more. Adds charm to garden, yard, patio, deck and garden. Versatile enough to function as hammock chair, room display, or one of a kind piece of art. STURDY & STYLISH DESIGN：Made of 100% handmade cotton, the rope and swing design feature macrame net chair pattern with fringe tassels. 300 pounds weight capacity with dimension of about 80cm x 60cm x 132cm/31.5 "L X 23.6" W X 52 "H(Height of chair, without rope is 18.5"), very safe and suitable for both adults and children. EASY TO INSTALL: Package come with HAMMOCK HANGING ACCESSORY.You can hang it countless places you want, indoor or outdoor. Set it up in minutes. It can be suspended from the ceiling inside of your room, from sturdy branch in your garden, from a strong beam on your porch. If you have any questions about this product by Apollo Box, contact us by completing and submitting the form below. If you are looking for a specif part number, please include it with your message.